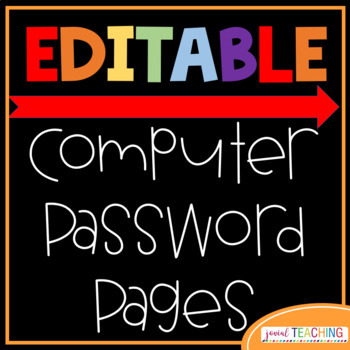 This is a PowerPoint file in which you can create editable student sheets with the usernames and passwords for ALL the sites they encounter in a given year. Let them take them with them to other classes, and even to the next grade. It is a futile point to keep writing them down and having kids lose them on tiny pieces of paper. 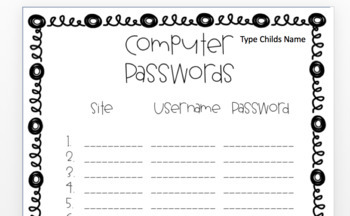 These will keep them all on full size pages and you can even laminate them and write on them with SHARPIE even. Then use the old trick of coloring over the SHARPIE with dry erase and wipe away at the end of the year to remove the writing and save the laminated sheets for next year! I've also included directions to show you how to get TPT Credits to save $$$. Follow my store by clicking next to the star and the top of my store please... this will get you alerts on SALES and NEW PRODUCTS!